Having previously read most of (truth be told, all except for one) Morgan Matson book, I knew I had to pick this one up when I saw it laying on my sister's table. I can happily say I'm a big fan of Matson's books, and they have successfully never failed to disappoint me. Its summer, and I think it was perfect for me to pick a book for this season. Andie, the main character of this book, was an interesting character who we could inevitably see grow and develop from the start to the end of the story. To start with, her summer was going to be a great experience for her as she got the chance to intern at the place she's always wanted. She has a group of friends that any person could wish for, and her love relationship seems to be relaxed with no strings attached. Everything is exactly as how Andie wants it to be, and she's happy with the direction her life is taking. Here's the twist, something happens that results in Andie's so called perfect plans to be changed. The story grows from here on. Andie has to adjust to the current situation, and tries to make the best of it. Personally for me, the story was interesting, chill, but not so much a page turner. At some point I felt like a few parts were prolonged unnecessarily, and it would have been better off reduced. The middle of the book was the slowest for me, but I was glad it started to pick up its pace again with more drama and unexpected events towards the end of the book. Overall, I wouldn't say this was my favourite Morgan Matson book by far. I don't think it was very memorable. Just a book that was enjoyable during the time, and then to be forgotten later on. 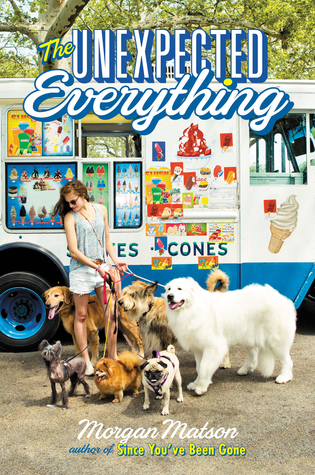 If you're looking for a chill book to read on a summer day, I would recommend The Unexpected Everything. I've been seeing this book everywhere but haven't read very many reviews of it. I don't read YA very often, so good to know that I should probably skip this one. Great review! I liked this one but thought it was way too long and a bit too slow. I need to read more books by this author!